Journal photo by Ingrid Howard. Most Southerners don’t need this type of advice, but the internet is full of tips on how to welcome friends to your home: Greet them warmly. Invite them inside. Offer to give them a tour of your house. Volunteers at the Decorators’ ShowHouse tick all those boxes. Hosted by the Symphony Volunteer Council, this year’s ShowHouse opens April 27 and closes May 12. This is Bloetscher’s third year to head up the ShowHouse committee. Her co-chairman is Pam Wood. Nan Teninbaum, ShowHouse publicity chairman, agreed that the ShowHouse helps those who participate connect with each other. “I’ve met some of my closest friends through the Symphony Volunteer Council,” Teninbaum said. 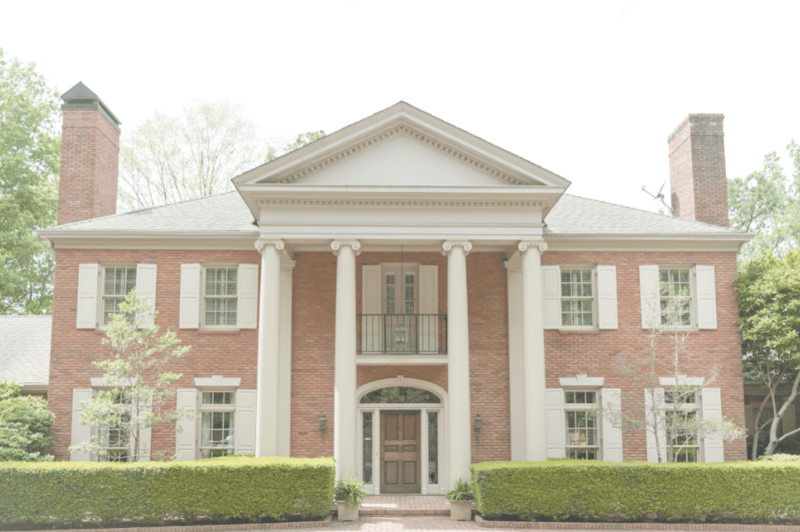 The 2019 ShowHouse is the Lemak estate on Cherokee Road in Mountain Brook. Dr. Larry Lemak, a well-known orthopedic surgeon, and his wife, Georgine, raised their family in the stately yet livable house that sits at the top of a winding driveway. Recently, the Lemaks decided to downsize, and the Cherokee Road house was put up for sale. “Working with the Lemaks has just been a delight,” Bloetscher said. The ShowHouse officially will open with a ribbon-cutting ceremony at 10 a.m. on April 27. Tour hours are 10 a.m.-3 p.m. Tuesday-Friday, 10 a.m.-4 p.m. on Saturdays and 2-5 p.m. on Sundays. Parking is at Mountain Brook Presbyterian Church, 3405 Brookwood Road. Mini-coach buses will run continuously during regular ShowHouse hours. The last bus leaves for the ShowHouse one hour before closing time. It’s always a treat to see the rooms created by the decorators who participate. Main level spaces and their designers are, for the foyer, Griffith Art Gallery; the living room, Lynne Coker Interiors; the powder room, Deeply Southern Home; and the master bedroom and adjoining sitting room, The White House Interiors. Just off the master bedroom are his-and-her bathrooms plus spacious closets, which will be filled by Town & Country Women’s Clothing and Mobley & Sons. Also on the main level are the great room by Issis & Sons Furniture Gallery, the keeping room and breakfast nook by Umphrey Interiors, the gourmet kitchen by Christine’s, and the dining room by Arhaus. BumperNets has filled the den with a pool table, arcade games, a foosball table and more fun-and-games items. Upstairs, you’ll find more artwork from Griffith Art Gallery, the library by Lynne Coker Interiors, a bedroom and bathroom by The White House Interiors, another bedroom from Bridget McCart Interiors, and separate super-fun bedrooms for a boy and a girl by Pottery Barn Kids. Outside, a gazebo houses a hot tub. Nearby is a sparkling swimming pool. Decorator seminars will be held again this year. All are at 1 p.m., and there’s no charge to attend if you have a ShowHouse ticket. Sessions include “Get Your Home Market-Ready” by Barbara Cooney, April 30; “Choosing the Right Artwork and How to Display It” by Umphrey Interiors, May 1; “Create an Inspiration Board: Five Tools for Visualizing Your Ideas” by Lynne Coker Interiors, May 2; “Defining Your Design Style” by Arhaus, May 3; “A Florist’s Guide to Choosing and Arranging Flowers in Your Home” by Wild Things, May 7; “Color, Art and How to Incorporate Them in Your Design” by Umphrey Interiors, May 8; and “Timeless and Trending Interiors” by Leslie Davis, May 10. The seminars aren’t the only special features at the ShowHouse. Darlene Real-Higginbotham will present a fashion show from 11 a.m. to 12:30 p.m. on May 9. Doodle’s Homemade Sorbets and Ices will be served from 11:30 a.m. to 3 p.m. on Saturdays. On Mother’s Day, May 12, moms, grandmothers and mothers-to-be will receive flowers. The Margaret Alford Tea Room will be open from 11 a.m. to 1:30 p.m. Tuesday-Friday. Each lunch is $15. For reservations, required for groups of five or more and strongly suggested for everyone, call 991-2712. The Symphony Shop will be filled with handmade items and antiques that you can buy and take home. The Decorator Sales office is open daily in the house’s kitchen area. Those who are interested in buying items from the ShowHouse can get price lists from each room hostess. Pre-sale tickets, available until April 26, are $20. Buy them online at svcalabama.com or at outlets listed on the website. After April 26, tickets are $25. Tickets for groups of 20 or more are $20 each. You can follow the ShowHouse on Facebook, too. There are a few house rules for visitors. No infants or children under age 8 are allowed, and you can’t bring large purses, totes, backpacks or umbrellas or take photographs. Bloetscher and Teninbaum said ShowHouse volunteers are always needed and welcomed. “It takes a continent, not a village, to staff this house,” Teninbaum said with a smile. Bloetscher said the fundraiser is a team effort. Despite all the planning, hard work and long hours, the two women agreed that they love being a part of this annual event. “ShowHouse has decorated our lives,” Bloetscher said.